When the promos of Guzaarish first came out, everyone expected it to be in the league of director, Sanjay Leela Bhansali’s last film, Saawariya, which sank at the box office. The reason for the comparison was the whole gloomy look and feel that the director created for the new film despite the last one giving the audience blues (literally). If Saawariya was blue-green, Guzaarish is red and black… each frame of the film is highly stylised and put together with artistic finesse. Each image can be exhibited in a gallery as art; however, these frames together fail to ignite the magic that Bhansali’s earlier works created (Hum Dil De Chuke Sanam, Black). While most disliked the film, I liked Saawariya for what it was, a moody musical and closer to a play than a film. Guzaarish once again falls in the same category and doesn’t hold together as a film as it could have. How I wish, the perfectionist filmmaker obsessed a little less with the way his film looks as little imperfections make things a bit more real. Guzaarish tells the story of Ethan Mascarenhas (Hrithik Roshan), a renowned magician who gets confined to a wheel-chair after an accident during one of his acts turns him into a paraplegic. Despite his condition, Ethan leads a dignified life running a radio programme on how life is so beautiful and being a role model for many. One fine day he decides to say adieu and files a petition for euthanasia or mercy-killing to end his suffering. His decision puts a question on another person’s life that revolves around him, Sofia D’Souza (Aishwarya Rai Bachchan), his nurse and caretaker for the last twelve years. Sofia’s life has only one motive, which is to look after her master/patient/object of affection, Ethan and with him that may also disappear. The film mainly revolves around Ethan and Hrithik has done a good job of creating a character who is eccentric, genius, funny, bitter and romantic in equal parts. However, there is one thing that is missing that makes a lot of difference to the film… you are unable to connect emotionally with Ethan the way you did with Michelle in Black or Rizwan in My Name is Khan. In fact, you feel more for Sofia which says a lot about the character and the way Aishwarya has portrayed it. Aishwarya emotes well and says a lot through her expressions without many dialogues; only her loud costumes distract (Sabyasachi). This is one of her best performances and I am beginning to feel that roles that require her to speak less and emote more, suit her better; case in point, Guru and Jodhaa Akbar. There is an interesting supporting cast in the film that completes the picture – Shernaz Patel as Devyani Dutta, Ethan’s lawyer is good and so is Rajit Kapoor as the public prosecutor; Aditya Roy Kapoor as an aspiring magician is as impressive or unimpressive as his last outing in Action Replayy; Nafisa Ali as Ethan’s mother is graceful and Suhel Seth as his doctor is just about tolerable (better than his prime time news appearances). Model, Monikangana Dutta’s much talked about debut in the film as Estella Francis, Ethan’s ex-girlfriend pans exactly three and a half scenes; and she doesn’t shine in them. Coming to the technical department, music by Sanjay Leela Bhansali is termed soulful by many but I find it very average; a better soundtrack could have lifted the film a few notches up. Screenplay by Bhansali and Bhavani Iyer is extremely laidback making the film seem long even if the duration is only two hours. Sudeep Chatterjee’s cinematography is beautiful and Sumit Basu’s art direction is good as per the director’s brief; however, the heavy Portuguese hangover does not quite go with the times we live in today. Same with Sabyasachi’s costumes for Aishwarya that look beautiful for a ramp show but on a nurse, they look outlandish. I am not saying that she should have been dressed in drab clothing but the Indo-Spanish look made her look a little unbelievable. Guzaarish has its moments and I enjoyed it in parts… the opening sequence that shows Sofia’s daily routine with Ethan is one such part and drive outside the house is another. Unfortunately, the whole here is not greater than the sum of its parts. On another level, I think that we, and I mean the audience here, do not understand the artist called Sanjay Leela Bhansali, perhaps the same way he doesn’t understand us anymore. Do watch Guzaarish if you like any of the lead actors or the director or have the patience to appreciate each picture you see on screen. Once again, Guzaarish is not a bad film but is certainly not a master stroke. Shyam Benegal was never known for comedies but for meaningful cinema that was labeled art-house and alienated mainstream audience. Films such as Ankur, Suraj Ka Satvan Ghoda, Mandi, Mammo, Sardari Begum and others may have been extremely good but not money spinners at the box office. Even Zubeidaa featuring Karisma Kapoor, which was almost a mainstream Bollywood flick, pleased only the niche Benegal audience and not the masses. However, with the evolution of the multiplex audience, Benegal has started dabbling with a genre that he hasn’t attempted before – comedy. Well, actually it is satire and he touches upon a lot of relevant issues through his latest films like Welcome to Sajjanpur and Well Done Abba. This new Benegal brand of cinema is extremely refreshing when all we get today are sexist and vulgar jokes in the name of comedies. Well Done Abba is set in a village called Chikatpalli, somewhere near Hyderabad and focuses on a number of issues such as corruption, water shortage, illiteracy, emancipation of women, amongst others. Boman Irani plays Armaan Ali who is concerned about his daughter, Muskaan Ali’s (Minisha Lamba) marriage and wants to get a baori (well) dug in his fields under a new scheme by the government. The film traces Armaan’s journey as he struggles with the corrupt government machinery and later his battle against the same, which is master-minded by his fiery daughter. Boman Irani is simply outstanding in the film and proves that the character and the actor playing it are more important than the star. Minisha Lamba is the film’s surprise package and is extremely confident even with the Hyderabadi accent. Other supporting actors like Samir Dattani, Ila Arun and Ravi Kissen are good but fine actors like Rajit Kapoor and Sonali Kulkarni are not given substantial roles. The film’s strength is its simplicity and situational comedy while its length is its weakness (nearly two and a half hours). The first half of the film moves slowly establishing each of the numerous characters and the film picks up post interval. The editing could have been much better to make the film crisp and more impactful. Music by Shantanu Moitra is nothing great and the songs were not required at all; why couldn’t they just stick to only background score? 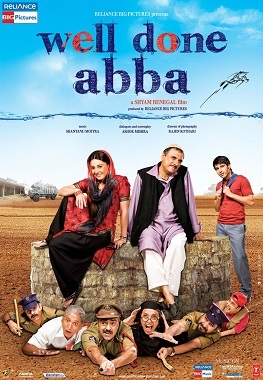 Overall, Well Done Abba is a delightfully refreshing film but requires a little patience due to its length.